The eyes are often the first things others notice about you. Eyelid lift surgery is the most common form of cosmetic surgery, and is performed to remove excess fat and skin from around the eyelids. To achieve the best results, eyelid lift surgery is most commonly combined with brow or forehead lift surgery. 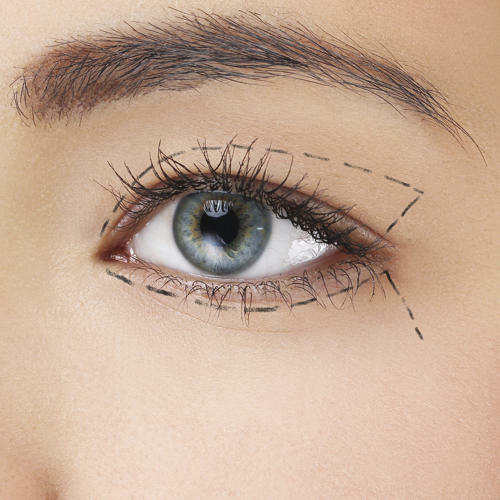 Eyelid lift surgery can both improve the appearance and the function of your eyes. As you age, the muscles supporting your eyelids weaken, allowing fat to collect above and below your eyelids. The accompanying sagging often causes impaired vision. By treating your droopy upper lids and bags beneath your eyes, Dr. Jaggi may additionally be able to help eliminate the vision problems caused by aging eyelid skin. Eyelid surgery is a relatively simple procedure designed to eliminate excess fat and skin from the upper and lower eyelids. It is often an introductory procedure serving to provide rejuvenation to the first area that usually succumbs to the aging process. Candidates for blepharoplasty are concerned about the tired appearance they project even when they are fully engaged and energetic. They may also have impaired peripheral vision caused by excess skin blocking their full vision. This can interfere with reading, driving and other activities. Patients are often delighted to find that recovering from a blepharoplasty is easier than expected. Recovery from eyelid surgery generally takes 1-3 weeks. They report that they feel mild discomfort after the procedure and easily manage with over the counter pain medication. During the first few days you will see bruising, swelling and possibly redness in the whites of your eyes. This will diminish over the next week and by the end of the second or third week, about 90% of the exterior healing should be complete. A certain degree of swelling and bruising is normal. Cold compresses, as well as head elevation when lying down, will enhance healing and relieve discomfort. The use of cold packs is recommended to minimize swelling and bruising. On the first day, the packs should be applied every hour you are awake for 10 or 15 minutes. This schedule can be reduced to every few hours on the second and third day. Patients who are able to keep their head elevated while sleeping or lying down can reduce swelling and experience faster healing. Patients should rest as much as possible for the first few days and allow your body to heal. The speed at which you can return to work or social activities depends on several factors. Healing will be faster for patients simply having skin removed than for patients also having fat removed with muscle adjustment. Most patients can return to work and social activities after about 10 days on average. Avoid taking aspirin, anti-inflammatory drugs, and herbal supplements as they can increase bleeding. Please arrange for a responsible adult to take you and pick you up from your surgery and stay with you for the first 24 hours after surgery.